The December 2015 national elections ended the two-party system - PP, PSOE, Podemos and C's got 123, 90, 69 and 40 seats respectively, and with 176 seats needed to form a government predictably nothing happened. A June 2016 election did little to resolve the gridlock, but an amazing series of events, including the PP and C's forming an alliance, the PSOE - which wanted to abstain in the investiture vote so that a minority government could be formed - turning on its own leader (Pedro Sánchez) who disagreed, forcing him to resign, finally led to a Mariano Rajoy-led government being formed after 10 months of political limbo. Vallekas has never voted for the PP. Staunchly left wing, they will proudly wave the flags of the Anarchists and the Second Spanish Republic - red, yellow and purple - as a throwback to a time Vallekas was known for being the resistance to Franco's right-wing dictatorship; to the times he sent baton charges and water cannons to crush illegal strikes in the factories of Vallekas.. The PSOE was the preferred party of choice for the Vallecanos, but Podemos' surge and left-wing platform means that Podemos won in Vallekas both times - and it wasn't even close. Ironically, Pablo Igesias is named after the man who founded the PSOE in 1879, which shook Spain the way Podemos did. And not surprisingly, Pablo Iglesias is from Vallekas. As a teenager, Iglesias was a member of the Communist Youth in Vallecas. He still lives there today, in a modest apartment. Vallekas is one of Madrid's poorest but proudest barrios, or neighbourhoods. Vallekas is made up of two districts: Puente de Vallecas and Villa de Vallecas. But residents choose to name the area as Vallekas, a countercultural attitude of replacing the c with a k that defines them entirely. The story goes that the Christians conquered a valley owned by an Arab rich man called Kas, and named it Valle del Kas, and that with time the village was called Vallekas. But to adequate the name to the Spanish good forms, the village was called Vallecas. Vallekas was an independent village until the 1950s, when the government decided to merge the village with Madrid. People who were escaping the poverty of their towns wanted to work in Madrid came and lived in Vallekas. And even though Vallekas is a part of Madrid, its residents are those of the Independent Republic of Vallekas - they are vallecanos. A town that is proud of its working class ideals and its political views - graffiti-daubed et al. Whether the issue is social or economic, the target is people or the government, or the message a rise to arms or an expression of speech, you can be sure to find the graffiti art that's right for you. There are even messages on how to be political - Pablo Iglesias's building has a slogan that reads "Defend your happiness, organise your rage". It is that politics that Rayo Vallecano, the club, represents. Symbolizes. Is. Irrevocably, Rayo is Vallekas and Vallekas is Rayo. In the 2016 local elections, the Partido Popular won all but three of Madrid's municipal districts. They were Puente de Vallecas, Villa de Vallecas and Centro. The first two make up Vallecas - the third, as the name suggests, is the central district of Madrid where the government of the Community of Madrid sits. (You can read more about Vallekas here). Those three were won by the new left-wing Unidos Podemos. Well, them, and a couple of other parties that have formed a coalition in Madrid called Ahora Madrid. Below, you can see the red fade away - the PSOE being replaced by Ahora Madrid. 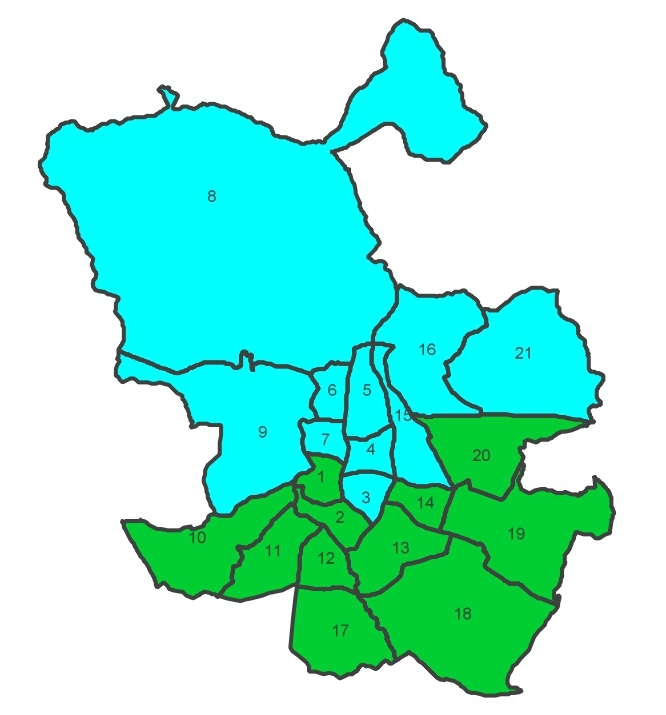 1991 Madrid City Council Election. Blue: PP. Red: PSOE. 1995 Madrid City Council Election. Blue: PP. Red: PSOE. 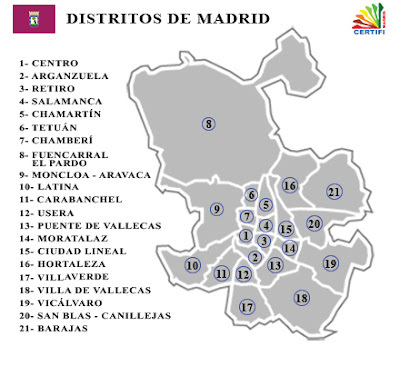 1999 Madrid City Council Election. Blue: PP. Red: PSOE. 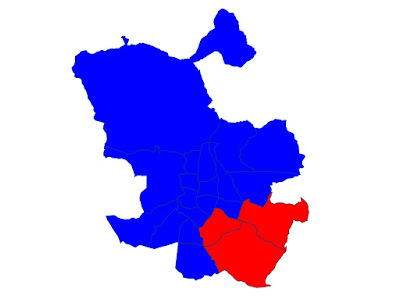 2003 Madrid City Council Election. Blue: PP. Red: PSOE. 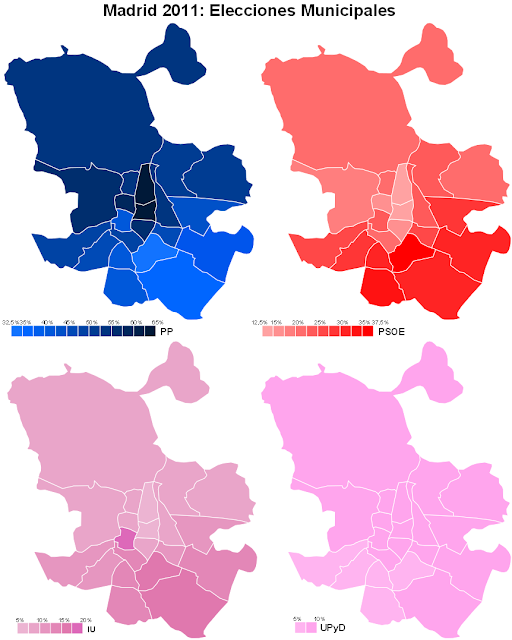 2007 Madrid City Council Election. Blue: PP. Red: PSOE. 2011 Madrid City Council Election. Blue: PP. Red: PSOE. 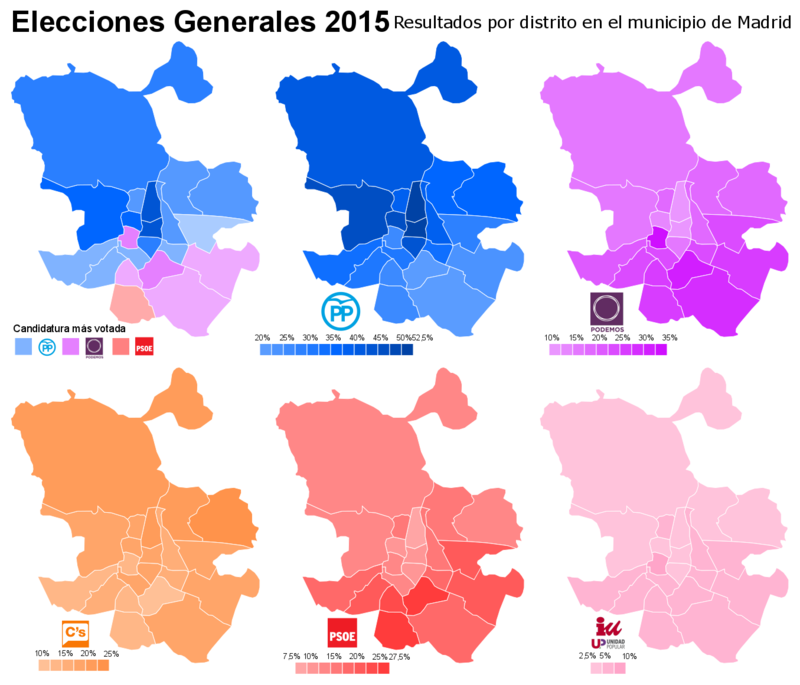 2015 Madrid City Council Election. Blue: PP. Green: Ahora Madrid.